As all of America knows, the NRA made big headlines during the 146th NRA Annual Meetings and Exhibits in Atlanta, Ga., last week, and kicking it all off on Apr. 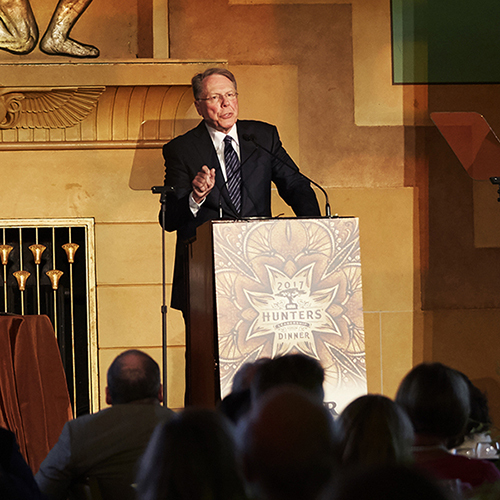 27 was the annual NRA Hunters' Leadership Forum (HLF) dinner on the eve of opening day. Imagine being in the mix as NRA leadership and influential business leaders worldwide—all passionate about hunting and protecting its future—packed Atlanta’s historic Fox Theatre. From NRA EVP Wayne LaPierre to NRA HLF co-chairs—NRA 1st Vice President and NASCAR Hall of Famer Richard Childress and NRA Women’s Leadership Forum Executive Committee member and Houston Safari Club past president Melanie Pepper—to keynote speaker Donald Trump Jr. and hunting industry innovators such as Brenda and Larry Potterfield—co-founders of Midway USA and recipients of the 2017 NRA Golden Bullseye Pioneer of the Year Award—attendees were in great company. While positive energy ran high, the evening’s mission was evident: to step up the fight to save hunting’s future. Why? Because history shows what happens when lawful hunting comes under attack: Wildlife suffers as funding for habitat restoration and wildlife management disappears. Yet well-funded anti-hunting, animal-welfare extremists are fighting a culture war to end all hunting so the NRA and the NRA Hunters’ Leadership Forum are fighting back. First up: Enter the "NRA Hunting" campaign featuring a series of pro-hunting TV ads running across America and all housed on the campaign website, NRAHunting.com. Combine this with NRA’s efforts in the political arena and efforts of the HLF Network—industry partners committed to gong on offense by partnering to share NRA HLF website (NRAHLF.org) and social media content showcasing the news headlines on hunting issues across their social media platforms. And that is exactly what we American hunters face in the 21st century as groups such as the Humane Society of the United States (HSUS) and PETA lie, distort the facts and say and do anything to push their agenda. For proof, look no further than the national furor they incited over “Cecil the lion.” The fight isn’t about lions or ivory or semi-autos or anything else. It’s about shutting down hunting altogether. Yes, your NRA is invested in the fight. And with a thematic platform serving as the foundation, we can—and will—win this battle to save hunting. Topping off the event was the presentation of the 2017 NRA Distinguished Leadership Award to wildlife biologist and conservation advocate John Frampton. President and CEO of the Council to Advance Hunting and the Shooting Sports, Frampton’s career comprises decades of coordinating conservation policy initiatives among government agencies, private and non-profit organizations and pro-hunting industry groups. Under Frampton’s leadership, as previously covered for NRAHLF.ORG by 2016 NRA HLF award recipient and researcher Mark Damian Duda, the council recently unveiled the National Hunting and Shooting Sports Action Plan providing specific research-based recruitment and retention strategies to enhance participation in and support of hunting and the shooting sports. In step with the NRA HLF’s mission to grow America’s cherished hunting traditions, he also has served as a past president of the Association of Fish and Wildlife Agencies (AFWA) and the director of the South Carolina Department of Natural Resources, drafted the North American Waterfowl Management Plan, and is a member of the Wildlife and Hunting Heritage Conservation Council.